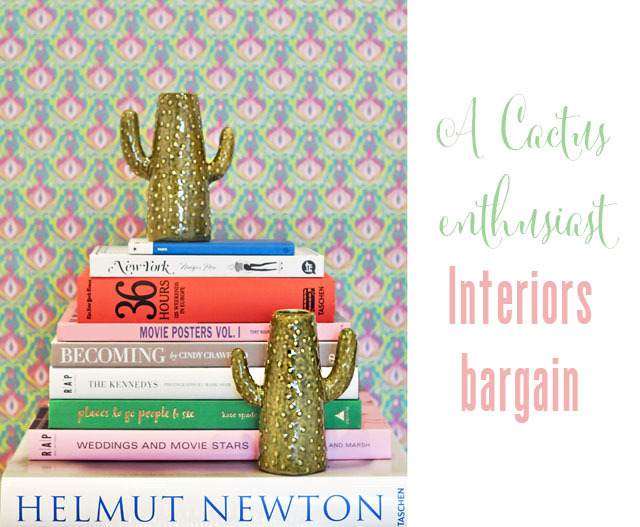 Interiors Alert: Cacti for all! I'm not one who often wanders into this particular store these days, but I saw a certain green arm sticking out a customer's bag as they were leaving and it peaked my interest. Of course the interiors choice for decorative vases in 2016 was inspired by our prickly friend the cactus. They have been everywhere, showcased from instagram to interiors mags. So imagine my surprise at finding this absolute bargain, a cactus vase, for £3 ($5). Of course I'm speaking of the penny pincher's paradise that is Primark. Yes, the price is so good and quality so outstanding that I had to purchase twins! At £3 these won't be around forever, and sadly they aren't available online, so you'll have to get into a Primark store now to hunt them down in the home section. For those of you too far afield to just pop into a shop, here are a few options online that are equally impressive as far as value for money! Have cacti hunting!